It is great to enjoy the results of perfect garage door installation. Before this moment arrives, however, ensure you select the ideal unit. This is possible as long as you are well familiar with the main options which are available. Find out more about the most widely used types of residential doors. 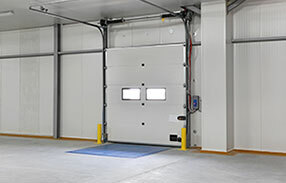 The sectional doors are the most commonly found. As their name suggests, they consist of horizontal sections which are connected with the use of hinges. This makes it possible for the sections to change their position from vertical to horizontal at the curved section of the garage door tracks. In this way, the door does not get out of the contours of the frame during opening and closing. This makes it super practical. It saves space while reducing the risk of an accident to the very possible minimum. The main drawback of the sectional design has to do with the super thin slots between the sections. They let outdoor air in and reduce the overall level of energy efficiency. Still, designers are implementing effective solutions to reduce the air leakage. The slots also pose a risk of finger pinching during garage door maintenance. Serious injury is highly unlikely, but extra care must still be taken. The one-piece doors, which are also known as tilt units, have a single panel which fits in the frame. This single panel is tilted in order for the unit to open and close. It goes out of the frame in the direction of the driveway. As a result, the user must be careful to stop the car further away and to ensure that there are no other objects or people in front of the door. While this type of overhead door provides better insulation, it is less safe, and less practical compared to its sectional counterpart. There are also residential roll up garage doors. They use a single piece of corrugated steel or fiberglass which is flexible. When the door opens, the flexible panel gets rolled around the shaft which is mounted on the wall above. These units use wall-mounted jackshaft openers. 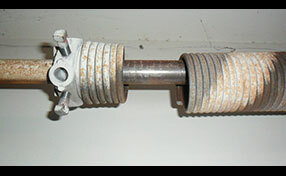 The opener is connected directly to the shaft and turns it. The rollup units are simple and practical, but they are not as strong and durable as their counterparts. One major issue with them is they cannot be insulated. Use the provided information to make the best choice.